On January 27, 2012, the Learning in Afterschool Project will sponsor a one-day conference entitled How Kids Learn. One of our featured speakers will be Alexis Menten from the Asia Society. Learning that expands young people's horizons is one of the five key learning principles of the Learning in Afterschool Project. This includes the promotion of global learning and understanding. You can read Alexis’ views on expanding horizons, lengthening the school day, and global competencies by viewing her post on the Global Learning blog. The Asia Society also offers a resource website to guide afterschool programs in promoting global learning entitled Expanding Horizons. To learn more about an award-winning youth program that is focused on developing young people’s global competencies and view some of their resources, check out Global Kids. 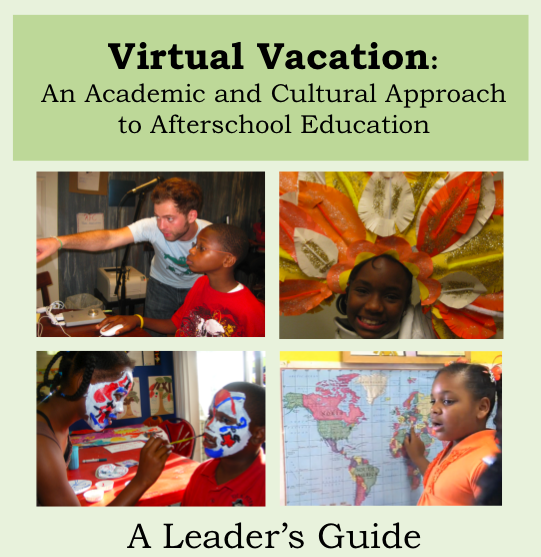 A new publication entitled Virtual Vacation: A Leader's Guide offers an integrated approach to promoting global awareness. It will be available from Temescal Associates very shortly. This approach was developed by the NHP Foundation and implemented in afterschool programs near New Orleans. Alexis Menten is a Director in Asia Society’s Education division, where she leads afterschool and youth leadership initiatives for the Partnership for Global Learning. The Partnership connects educators, business leaders, and policymakers to share best practices, build partnerships, and advance policies to ensure that all students are prepared for work and citizenship in the global 21st century. In support of this mission, Alexis directs Asia Society’s Expanding Horizons initiative, which provides technical assistance, professional development trainings, and resource publications that advance global learning as an essential approach for all high-quality afterschool and summer programs, and as a means to build collaboration between schools and community partners. She is a graduate of Bryn Mawr College.